Could this week mark the beginning of the end for ATC? The FCC’s NPRM/NOI issued on Thursday clearly indicates that we are approaching the point where the 2GHz band will be redesignated for terrestrial-only use, with the ATC rules abandoned, and some form of compensation paid (to the government) for the step-up in value accruing to the current 2GHz spectrum holders. It also looks quite possible that any attempts to offer MSS services in those bands could be discontinued, despite the $1.5B spent to date on satellites by DBSD and TerreStar. Ironically, this comes at a time when the only real barriers to ATC deployment are economic and financial, rather than technical. Even more significantly, the Wall St Journal is reporting that Harbinger is now seeking a $400M debt investment “to keep the [SkyTerra MSS-ATC] project moving forward” and “pay off debt coming due in the months ahead and other expenses related to the wireless plan”. This is a dramatic turnaround from the $1B to $2B of equity and bank financing that Harbinger was reported to be seeking back in April. 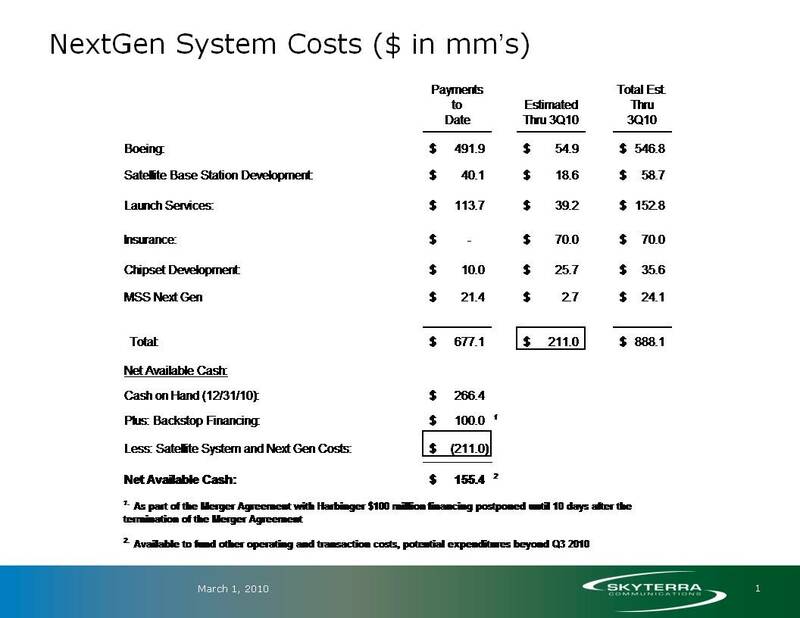 SkyTerra has numerous expenses coming due in the months ahead, according to its 2009 10-K, including $120M of vendor notes payable to Boeing, for which the principal is “due in full in December 2010″. Other items listed include the senior secured discount notes (cash pay from October 2010), and various other amounts related to next generation network construction, satellite launch services, and the “chipset, device and satellite base station subsystem” (which totalled an expected $150M during 2010, though could presumably be cut back). 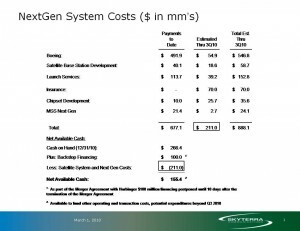 According to SkyTerra’s 2009Q4 results presentation in March 2010, the company also estimated it will need to pay $70M for insuring the SkyTerra-1 satellite launch (which is currently scheduled for August 17). Given these expenses, $400M of new debt wouldn’t provide much money to pay for any large scale terrestrial network deployment. More to the point, will Harbinger be able to continue to fund TerreStar, which has been costing about $10M per month to keep afloat, in addition to SkyTerra (note that SkyTerra’s existing funds were used for the most recent injection of $40M into TerreStar via a “Satellite Minutes Agreement”)? I’m sure we will see the answers to that question very soon, given that Harbinger’s current 90 day exclusivity agreement with TerreStar (signed on May 6) expires on August 4. At today’s FCC Commission meeting, the Commission began its proceeding “to spur mobile broadband investment in MSS bands”, which will take the form of a Notice of Proposed Rulemaking (NPRM) and a companion Notice of Inquiry (NOI). The NPRM and NOI have now been published along with a press release and accompanying statements from all five of the Commissioners. The NPRM is focused on two issues: First, it proposes to add co-primary fixed and mobile allocations to the 2 GHz band. Second, it proposes to expand existing secondary market policies and rules to address transactions involving the use of MSS bands for terrestrial services. However, given that the Commission notes that the Globalstar-Open Range lease was already evaluated under this standard, this second issue is more of a streamlining matter than a substantive change in policy. The NOI “requests comment on further steps the Commission can take to increase the value, utilization, innovation, and investment in MSS spectrum. It builds upon the proposals in the NPRM and addresses, in part, the recommendations of the National Broadband Plan for increasing terrestrial deployment in the MSS bands. The NOI inquires about ways to create opportunities for more expansive and efficient use of the 2 GHz band for stand-alone terrestrial uses. It also asks, if the value of the spectrum increases, what actions the Commission should take to further the overall public interest. Most of the NOI is focused on the 2GHz band, as I suggested last month, and suggests that either incentive auctions or a voluntary relinquishment of part of the spectrum would be means of providing appropriate compensation for the step up in value for the remaining spectrum. Of course, if part of the spectrum was relinquished, and the license for the remaining spectrum was still based on the MSS rules, it would quite possibly be necessary to continue to operate an MSS satellite. Such an outcome would almost certainly require a merger of DBSD and TerreStar (and disposal of two of their three satellites – 2 in-orbit and 1 ground spare), in order to reduce their satellite operating costs. What the NOI doesn’t do is make specific proposals about relaxing the ATC rules in the Big LEO and L-bands, although it asks whether there are “any other actions that the Commission could take that would increase terrestrial use of the MSS bands”. To me, the tenor of the NPRM and NOI suggests that the FCC feels it has given ground to Harbinger (in approving the SkyTerra transaction and ATC modifications) and Globalstar (with what will presumably be a near term approval of its ATC waiver requests, for which the deadline is now August 2). Now the FCC needs to sort out the 2GHz band and it appears to be adopting a somewhat harder line than some might have hoped. In his statement, Commissioner Copps highlights his belief that “charging fees for the ancillary terrestrial use in the MSS bands could provide incentives to ensure that the spectrum resource is used more efficiently and intensively”. However, whether this position will be shared more widely by the other Commissioners is still to be seen. This must be a disappointment to those who had hoped for a relaxation of the ATC gating requirements without any significant givebacks in exchange. In particular, it may be hard for the FCC to agree to such a relaxation if a hard line is taken over incentive auctions or other compensation for the “step-up in value” in the 2GHz band. With this proceeding going forward at the same time as MSS-ATC proponents are trying to secure partners and further investment (and in some cases are in bankruptcy or on the verge of it), it is going to be very interesting to see how the regulatory and financing activities affect one another over the next few months. Inmarsat has now launched its ISatPhone Pro, which I was lucky enough to try out the other week. Although the phone itself is not particularly attractive, the call performance was better than I expected – voice quality was good (with the other party easily recognizable), and the ability to ‘walk and talk’ was far superior to my experience with the TerreStar Genus phone. Latency was also somewhat better than on the Genus phone. The main limitation was that the phone only registers on the Inmarsat satellite when the antenna is extended and pointed in the direction of the satellite, which means there is a delay of 1-2 minutes before a call can be made, and calls will rarely, if ever, be received on the phone (assuming the user doesn’t want to carry it around with the antenna extended). Though Inmarsat’s phone is not expected to perform well at high latitudes (particularly in Alaska), it should generally be a good alternative for those MSS voice users who aren’t worried about carrying such a large device. The phone itself has been priced very aggressively, with pricing currently around $599 and in some cases close to $500. However, the most surprising development is the airtime pricing that Inmarsat has set. Postpaid wholesale pricing has been set very low, leading to retail offers of $150 per year with 60 free minutes of calls. Even more extraordinary is the prepaid pricing, where a user can buy a 25 minute card, valid for 2 years, for only $20. In my view the fact that Inmarsat has selected a uniform 2 year expiry date on its prepaid cards is a huge mistake, which I can only assume is due to the limitations of Inmarsat’s prepaid billing system (note also that prepaid service is currently not available in the US, due to patent litigation over the prepaid platform that Inmarsat uses). Iridium has previously indicated that about half of handheld MSS users are “glovebox”-type customers, who only use the phone for emergencies (and rarely use any minutes). To date such users have been paying at least $30 per month for satellite phone service (apart from occasional dual mode roamers on Thuraya), but now they will be able to get service for less than $1 per month. Inmarsat has thus completely undermined the economics of a significant part of the handheld MSS market, making it impossible for its service providers to justify targeting these customers (especially as SPs are busy competing away the margins which Inmarsat expected would be available on its handsets). In addition to leaving large amounts of money on the table, this action may also create added costs for Inmarsat, as these users are the least likely to be familiar with the limitations of satellite communications and thus may well end up consuming disproportionate levels of customer support resources. Inmarsat may well have had a reason to act in such a destructive manner a few months ago, when it thought it might have the opportunity to prevent Iridium gaining funding in the public markets to pay for its NEXT contract. However, now that Iridium can rely on more money than expected from COFACE, such a calculation looks less sensible. Despite having an attractive proposition for low end users, Inmarsat may still prove less successful than it hopes amongst higher volume users. In particular, these users will gain less of an advantage from the low occasional use tariffs, and may be somewhat reluctant to churn after making a substantial investment in buying an Iridium or Globalstar handset in recent years. Inmarsat has stated that it believes the average lifetime of a satellite handset is around three years, but in reality Iridium and Globalstar handsets are used for up to 8 years (and there is a thriving market for secondhand phones). As a result, churn in the handheld MSS market is much lower than Inmarsat apparently expects (even for Globalstar users, who have had to cope with a lack of two-way service in recent years), which will make it difficult to persuade large numbers of existing users to switch over rapidly to Inmarsat’s new service. On the other hand, competition from Inmarsat will potentially force Globalstar to offer rather more aggressive pricing as it tries to rebuild its subscriber base in 2011 and 2012. In the end therefore, Inmarsat may end up being able to trumpet a fairly large number of handheld subscribers (potentially up to 150K by 2014), but many of these will be less desirable customers and ARPUs may be rather lower than expected. Thus the overall impact for the handheld MSS market of Inmarsat’s new service (even when combined with Globalstar’s two-way relaunch in 2011) may remain subdued, and at best we expect wholesale revenue growth of no more than 10% p.a. in the next five years. Indeed a more pessimistic view, assuming significant erosion of ARPUs at the low end of the handheld market could put wholesale revenue growth at less than 5% p.a. over this period.